A terror cell caught with details of bomb-making and suicide vests may have been plotting to attack the Queen and members of the Royal family, it can be disclosed. The cell, which included Britain's youngest ever terrorist, arrested on his way home from his GCSE chemistry exam, was found with information about the Queen and the Duke of Edinburgh along with the Prince of Wales, the Duke of York, the Earl of Wessex and the Princess Royal. Also on the list were Princess Michael of Kent, The Duke and Duchess of Gloucester and The Duke and Duchess of Kent. 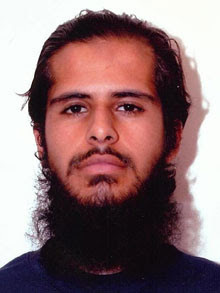 Aabid Hussain Khan, from Bradford, West Yorkshire, had compiled pictures, maps and details of the opening hours of official residences from information available on the internet. There were also details of London landmarks including the Houses of Parliament, Tower Bridge and the underground as well as the New York and Washington metros and a home-made video of the Washington Memorial and World Bank in the US. A counter-terrorism source said: "They had details of explosives and poisons along with information about London landmarks and a computer folder on Royal residences. We would be foolish to rule out the fact that they may have been planning an attack." Detective Chief Superintendent John Parkinson, Head of the Counter Terrorism Unit in Leeds, said the men posed a "very real threat". He added: "Let there be no doubt, these are dangerous individuals. These men were not simply in possession of material which expressed extremist views. They were also in possession of material that was operationally useful to anyone wishing to carry out an act of violence or terrorism." Khan, 23, was yesterday convicted of three counts of possessing articles for terrorism but the jury was not told he was part of a network of international terrorists in Europe and North America. It can now be revealed that Khan was closely connected to the alleged leader of a group of men currently awaiting trial for plotting an attack. Khan, using the name Ocean Blue, was also in regular contact with an aspiring suicide bomber in Edinburgh, Mohammed Atif Siddique. He had also communicated regularly with three terrorists who ran websites for Al-Qaeda in Iraq from London and Kent. Khan groomed Hammaad Munshi, then 15, the grandson of the head of a sharia court in Dewsbury, West Yorkshire. Munshi, who lived with his parents and four brothers, was carrying two small bags of ball bearings, a key component of a suicide vest, when he was arrested on his way home from Westborough High School in Dewsbury on the afternoon of June 2006. He had been running his own website selling knives and Islamic flags and using the online identity Fidadee – meaning "to die for" - on the auction website ebay. He also had hand-written notes on martyrdom and had created and circulated technical documents via email and secure web forums on how to make Napalm, how to make a detonator and the production of home made explosives. Operation Praline, run by the Counter-Terrorism Unit in Leeds, was sparked when police, acting on intelligence, stopped Khan at Manchester airport as he returned from Pakistan. Officers found two computer hard drives, DVDs, forged currency, false identification papers, handwritten notes and correspondence. Mr Denison said the collection amounted to a "terrorist encyclopaedia or library that would have enabled him or others to carry out terrorist attacks here or abroad in a variety of ways, and thereby to further the cause that appeared to be his mission in life - the war on western values and anyone who was a non-believer in the Muslim faith." Khan, an unemployed burger-bar worker, who used the email name Delboy and FoolsandHorses claimed he was selling Islamic streetware. It took detectives some time to unravel all Khan's aliases and some of the conversations he held in internet chat rooms, which were found on the hard drives, were discovered too late for the trial. Khan wrote to one recipient: "If you can find a big target and take it out, like a military base in the UK, then praise be to Allah. "Our group is growing. We need to plan better and to adapt now a few more people are showing interest. We need to confirm and to encourage...I want to have a group of at least 12 if possible." He reassured another correspondent who had told him: "I am not too sure about strapping a bomb to myself anymore." He also talked of explosives, warning: "You need to take care to store them in low temperatures otherwise they can kill. They must not come into contact with fire, oil or detergent." Another associate, Sultan Muhammed, 23, a postman from Bradford, fled to London with £1,265 in cash following Khan's arrest. When police raided his house they found maps of the London Underground, Jerusalem and Manhattan and a book entitled Suicide Bombings. "Perhaps one of the most chilling videos was one that provided a step-by-step guide as to how to make a suicide bomber's vest, using ball bearings as shrapnel and demonstrating the effects of such a bomb," Mr Denison said. Muhammed was found guilty of three charges of possessing articles useful for terrorism and another charge of making a record of useful for terrorism. Munshi, now 18, was convicted of making a record useful for terrorism. A fourth defendant, Ahmed Sulieman, 30, from south London, was cleared of all charges. It is clear that, since this cell possessed information on the monarch and other members of the royal family, they were at the very least considering the possibility of an attack on the Queen, or on a member of her family. Ought not such intentions—however notional they may have been—to kill or harm the reigning monarch be considered evidence of high treason? Or has British law changed in the interim to such a degree that it is no longer treasonable to plot against the head of state? Although Melancholicus is not one of Her Majesty’s subjects, he believes that such plots should be treated by the British authorities with the utmost gravity, for an attack against the monarch is more than an assault on a police station, or the congregation of a church, or the passengers on an aircraft. In a certain very real sense, the Queen IS England. An attack on the Queen is more than an attack on a single individual; it is the symbolic overthrow of the British state. The Islamists in Britain can reach no more significant a target than Her Majesty. Were they to succeed in such a venture, they could never top that success for its political significance however many planes they could bring down or however many people they succeeded in killing in events like the 7/7 bombings three years ago. In the reign of the first Elizabeth, plotters against the monarch were subjected to public evisceration and dismemberment as a warning to other potential malefactors, or—if they were of noble blood or had been royal favourites—to decollation. Either way, death was the end result. In the reign of the second Elizabeth, plotters against the monarch will appear before a court, with their human rights enshrined in law and—if convicted—will spend a few years in prison. Thereafter they will be released back onto the street, to resume their plotting from the point whereat it was interrupted, should they be so minded. Now while Melancholicus does not advocate a return to the savage butchery of the sixteenth century, he must nonetheless ask: where is the punishment that treason deserves?